You may have noticed that Fall has finally arrived and department stores are gearing up with the type of seasonal items that are synonymous with giving. Whether it’s trick-or-treat candy, Thanksgiving cornucopias, or holiday decorations, it’s also worth noting that October is Breast Cancer Awareness Month, and three leading researchers on campus are currently at work to give significant contributions to the community: answers in cancer research. Award winners Dr. Jiyong Lee, Dr. Nikki Delk, and Dr. Jie Zheng dedicate their lives to discovering breakthroughs that aim to change the face of cancer and save lives across the globe. This October, as we celebrate cancer research and our favorite Fall color – Pink! – we’ve asked them to share insight on why cancer research is important to them. Dr. Jiyong Lee is an assistant professor in the Department of Chemistry and Biochemistry and was awarded the Cancer Prevention and Research Institute of Texas (CPRIT) in May 2015. His research goals involve developing technologies and molecules to assist with cancer metastasis, drug resistance, and recurrence. Dr. Nikki Delk is an assistant professor in the Department of Biological Sciences who was awarded a Career Development K Award from the National Institutes of Health (NIH) and served as a UT Dallas – Mexico summer faculty member. Her research interests are centered around the effect of inflammation on autophagy and autophagy related proteins in breast and prostate cancer cell survival and treatment resistance. “Almost everyone I know has been affected by cancer directly or indirectly. Just in the past few years, I have known several young women in their 30’s and 40’s who were fighting breast cancer. Not everyone survived. These women are one driving force for why I take my job so seriously and have so much passion for what I do. But the reason I became a cancer researcher, and the core reason for why cancer research is so important to me, is my grandmother, Jean Celestine Harris. My grandmother died of brain cancer on the eve of what would be, 22 years later, the day I was awarded my doctorate. It was my mom and my aunt who brought that to my attention and I believe it was God’s divine intervention. “Prior to her diagnosis, my grandmother was not a typical grandmother – she did not cook, she dyed her hair auburn, she drove a black Camero sports car, wore designer clothes, and was a career woman who made more money than my grandfather – very unusual for a women born in the 1930’s. My grandmother was “cool.” She was also extremely intelligent. She graduated from high school and entered college at 16 years old. “My grandmother had a tremendous influence on who I would become – I also do not cook, I drive a black sports car, I am an academic and career-driven, and some might say I’m “cool”. When my grandmother was diagnosed with a brain tumor, I was still in elementary school, so when she had to leave her job due to her illness, she became my full-time babysitter. I remember my times with her so vividly and they influence who I am today. I remember lying next to her while she cried, but no tears would fall because the chemo-radiation had destroyed her tear ducts. I remember standing at her dresser, playing with her wigs that she used to cover up the treatment-induced loss of her beautiful auburn hair while she looked on smiling, too fatigued to get out of bed. I remember how we would celebrate the sparse wefts of hair that would grow back – as I brushed her hair, I remember how incredibly soft it felt. 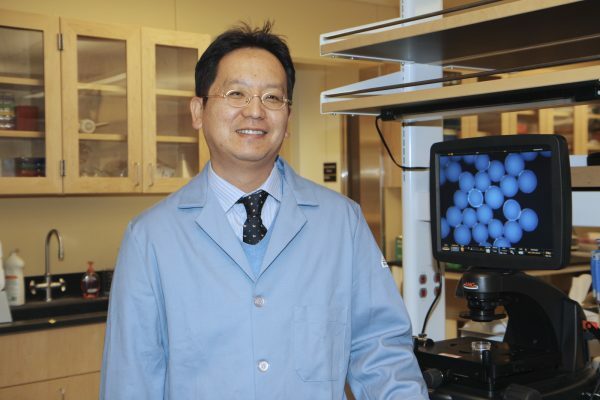 Dr. Jie Zheng is an associate professor in the Department of Chemistry and Biochemistry, as well as an adjunct associate professor in the Department of Urology at UTSW Medical Center. He received three awards from the Cancer Prevention Research Institute of Texas (CPRIT) since 2011. His research is focused on developing renal clearable nanomedicines for cancer diagnosis and treatment. Early detection is key. Regular cancer screenings assist in finding cancer before symptoms appear and increases the success of treatment. This Fall, give yourself the gift of health knowledge and schedule an appointment with your physician.